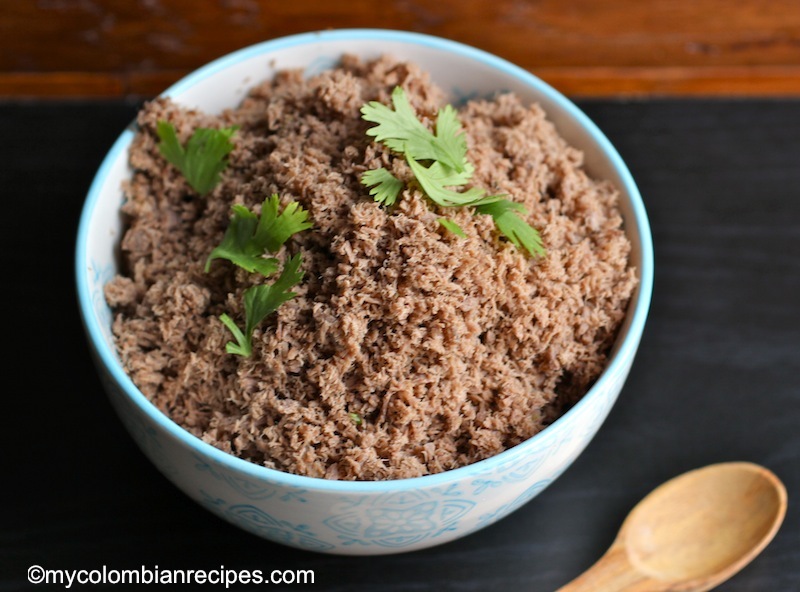 Carne en Polvo is a staple in the Andean region of Colombia. It is a bit bland if you it eat alone, but it is great as part of the “Bandeja Paisa”. My grandmother would mix it with hogao and serve it over white rice which was delicious too. 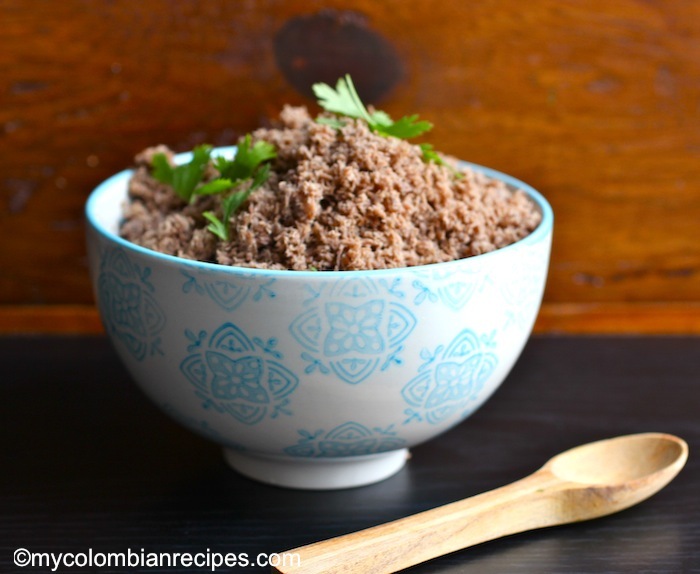 Carne en Polvo (Powdered beef) was one of my favorite foods growing up because I didn’t like to chew meat. My mom found that serving beef this way was the best way to get me to eat it. Place the flank steak in a plastic bag and add the garlic, scallions, onion cumin, salt and pepper. Refrigerate for about to 2 hours. In a medium pot, place the flank steak and water and bring it to a boil over medium-high heat. Reduce the heat to medium-low and cook the beef for about 1 hour or until the beef is cooked. Remove the beef from the water and set aside to let it cool. You can save the water used to cook the beef to make soup or just as a beef stock for other dishes. Cut the beef into chunks and place in a food processor. Process until the beef is of a powdered consistency as indicated in the picture. Your home must always smell delicious! I think the comment left by Rebecca was very true. 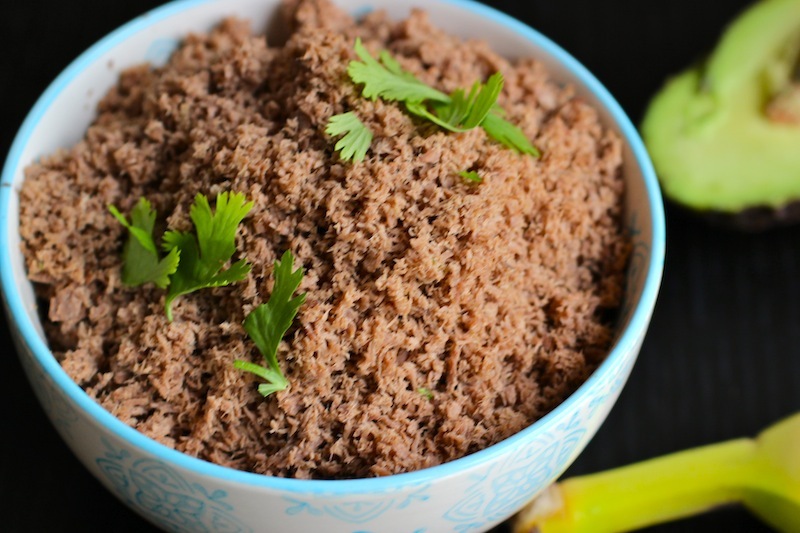 This recipe would be a great way to serve beef to young children. Erica- would you be interested in doing a blog post as a guest on my site? 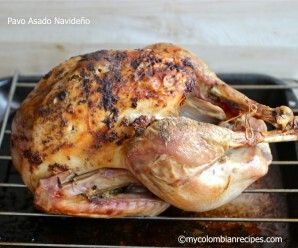 You could write about anything that you would like about Columbian food and/or culture. I love your web site and the recipes! If you are interested you can send me an email at fvknapp@embarqmail.com. Thank you Rebecca and Velva for your comments! Oh my goodness, your blog is amazing !! Erica thanks so much for your great recipes! My husband is from Cali and I had been looking for some recipes in English to make him his kind of comfort food. :0) You should have seen his face when I told him about the bandeja paisa recipe. We live in Madrid and I don’t have a food processor here… Any other way I can get a similar result for Carne en Polvo without one? Hi Rachel, Thank you so much for your nice comment! 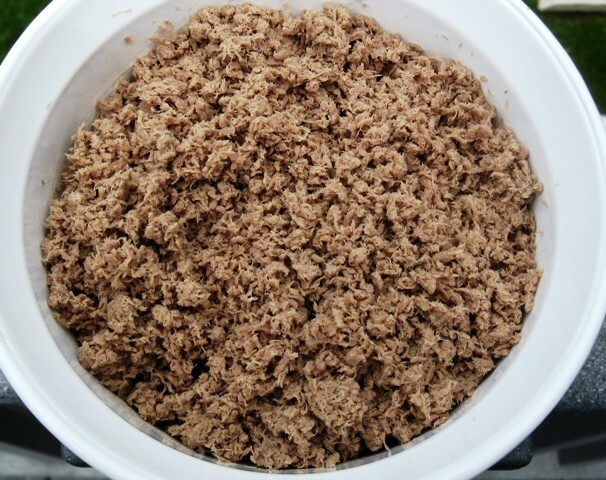 I am glad you like my blog 🙂 Actually, the best way to ground the meat is wit a “molino” It is a manual grinder we use in Colombia to ground the corn for arepas and the meat for carne en polvo, here in the USA I use a food processor. I have to check more to see if you can use something else. It looks delicious (and I do like it on a bandeja paisa) but flank steak is very expensive in the US to be treated that way. How would it work with a cheaper cut? Hi Respondon- I always use flank steak for this recipe, but I am going to try a different cut next time and let you know. 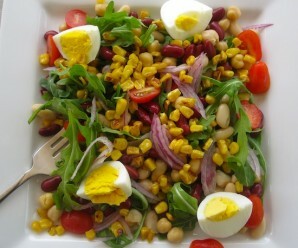 Erica, thanks for sharing this recipe. 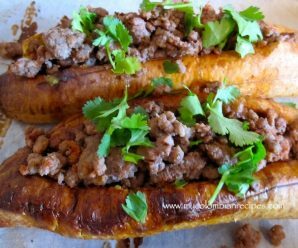 To help with others’ questions, we lived in Bogota, Colombia for 4 years and our maid always made this dish with ground beef (carne molida). We loved it. I am from Bogota andhave lived in Canada (Toronto area) for 39 years. I came to Canada with no knowledge in cooking, we always had maids. I learned to cook here and therefore my food was American/ Canadian ( Roast beef, Shepperd Pie etc.) I tried at the time but was very difficult to find the ingredients. In the last years more people from South American have inmigrated to Canada so it’s easier to find the ingredients. probably not as much as in US. I found your website going to google and looking for “pandeyucas”. 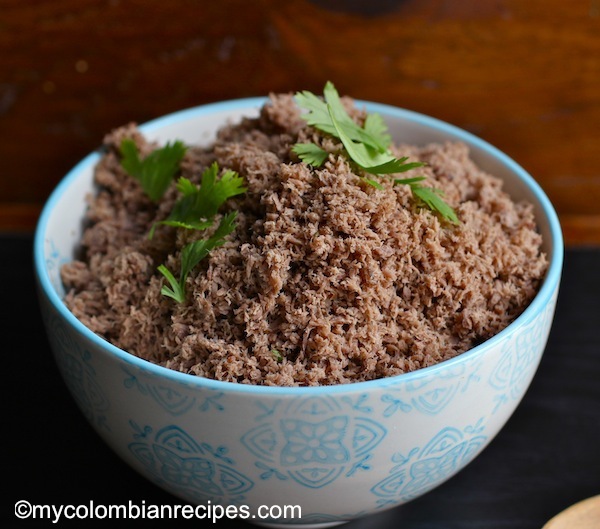 I am delighted to find all these recipes and even though you are from a different region – Antioquia- Colombian food is Colombian food and delicious no matter where from. Thank you so much for bringing a little piece of our “tierra” to people like me. Hi erica i am wondering what other type of meat could be used to make the carne en polvo. I know this was posted years ago but when you add to pot of boiling water, do you also add all that’s in the bag (garlic scallions and onions) or just the plain meat. I’m planning on making this tonight. Came from Medellin 50 years ago as a child. 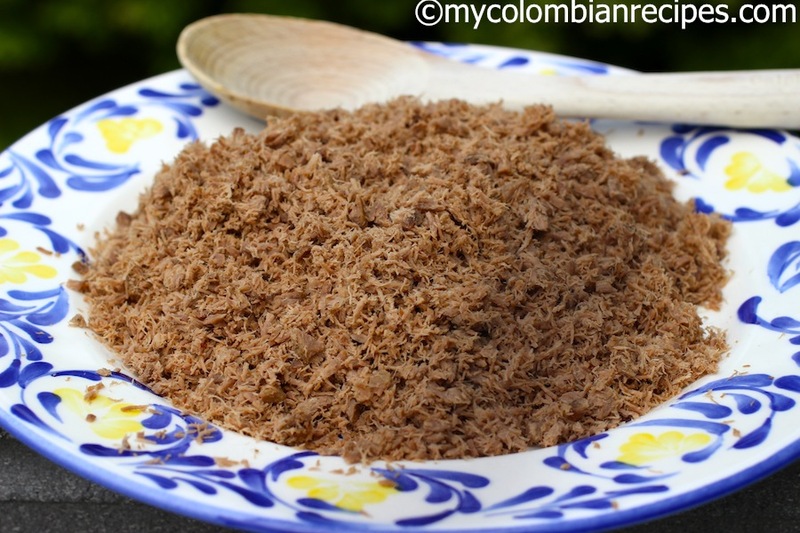 Remember fondly the delicious carne en polvo that “Barbarita” our cook used to make for us, as well as many other amazing dishes from Antioquia. I have missed them terribly. I wonder if a pressure cooker would work ? Than you for the simple recipe. I can’t wait to make it.